Google is great. This morning I was searching for some information on Think3 and it pointed me to this Think3 Virtual User Conference webinar held on 2nd November. It was presented by Scott Brighton, Think3’s new CEO, and he laid out in some detail the new vision for Think3. If you are a Think3 customer, I strongly recommend you click the link above and listen to the recording (registration required). The webinar is about an hour long and if you don’t have the time here is a summary. This was the first of a set of quarterly webinars that Scott will personally be giving. This webinar was focused mainly on the acquisition of Think3 and its new vision. Scott admitted that there were some concerns about the future of Think3 post its acquisition and hoped to put some of the fears to rest. He started out by giving an overview of acquisition and then dedicated the rest of the webinar to explaining the new vision for Think3. As regards whether key people were going or would change, Scott said, “There is going to be significant changes to personnel. Anytime there is an acquisition there are redundancies created“. He also stated that when Versata acquired Think3 it was a financially distressed company. It had a cost structure that made it unprofitable and put it in a significantly serious financial condition. He said that to ensure the company’s viability, there would be a need to let people go. As regards Think3 as a company, Scott said that it was now managed as a member of Versata Enterprises, a global company wholly owned by Trilogy Enterprises. He noted that Think3 was roughly their 20th Enterprise Software acquisition. He said, “We manage millions of lines of code and tens of thousands of customer relationships.” Scott has been with Trilogy for a decade and has run a number of companies that Versata has acquired, mainly those what were in trouble. He said that he had experience in turning around companies in distress. Apart from being the CEO of Think3, he is also the President of Trilogy, the parent company of Versata. He comes from a sales and marketing background. Think3 will continue to operate as a standalone company. It will have its own products, services and its own identity. There will be no rebranding of the Think3 product line to make it look like Versata’s products. Scott believed that the fundamental reason why he will be able to execute the turnaround was because Think3 now would be able to leverage the development and support resources of thousands of people spread across the world in the Versata family of companies. 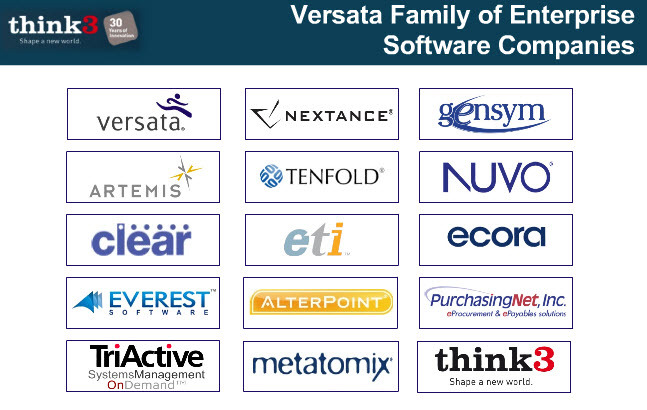 With the addition of Think3 this is what the Versata family of companies now looks like. Scott explained what he called his notion of customer success. He said that most companies spend 80 to 90 percent of their resources in acquiring new customers. “That is not our approach“, Scott said. “We are going to spend the majority of our effort in enhancing the value that we are delivering to our existing customers. We believe our existing customer base is our best marketing asset“. In fact, one of the reasons for acquiring Think3 was the unique surfacing capability in its products and a great customer base. Scott wanted to make a distinction between the way most enterprise software companies operate and the way he runs his companies. He said the top priorities in most software companies is growth, mainly due to pressures from investors. The second is profitability. He highlighted Think3 as an example which was forced to grow at such a rate that its profitability took a turn for the worse. According to him, customer success was the lowest priority. Scott’s priority is basically an inversion of this list. His top priority is customer success. He said that this was a metric that he actually measured. He said that he would be personally calling up every Think3 customer twice every year to ask if they were successful or not. In fact, he fired up a live survey in the Adobe webinar software and asked attendees to vote whether they felt they were successful or not. The results were Yes – 48% and No – 52%. The second priority would be profitability and last would be growth. Scott asserted that no Think3 product would be stopped. In fact, he said that they would continue to develop and enhance the entire think3 product line. He said, “Right now we are in the process of taking the code and evaluating its quality. Versata brings a rigorous process around software engineering. When we release code we see to it that its of the highest quality. Usually when we purchase a software company, we find that they are not using the same levels of software engineering as us. And that is the case with Think3“. He said that his primary focus would be to fix bugs and eliminate stability issues. The person driving Think3’s R&D will be Kumar Vikas, the head of Versata’s global development operations, who is based in their office in Dubai. Each Think3 customer will now have an account manager. They are also in the process of revamping the support system by clubbing it with Versata’s global support infrastructure. Scott reiterated that he expects to ramp up the investment that goes into R&D. He mentioned something called “WOW! Support” in which Think3 customers would be “delighted” with. He also mentioned leveraging the cloud as one of the areas that R&D will focus on. Previously Think3 customers had just one support plan. 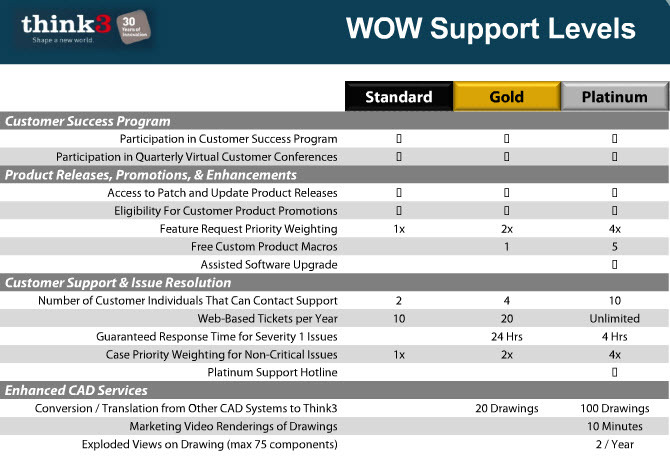 Moving forward there will be three support programs: Standard, Gold and Platinum. This is what they look like. The standard level is roughly the same as the current support plan. Customers on the Gold and Platinum can get custom macros created for them by Think3 personnel. They can even get CAD files translated from other CAD systems to Think3, video renderings of models created by customers as well as exploded views of drawings. Customers on Platinum will get higher priority when it comes to enhancement requests. There will also be a Platinum support hotline which will be available 24×7 in the local language. The best part is Platinum is only 16% more expensive than Standard. Existing customers can continue to stay on Standard or upgrade to Gold or Platinum. Existing support contracts will be honored through to the end of their term. 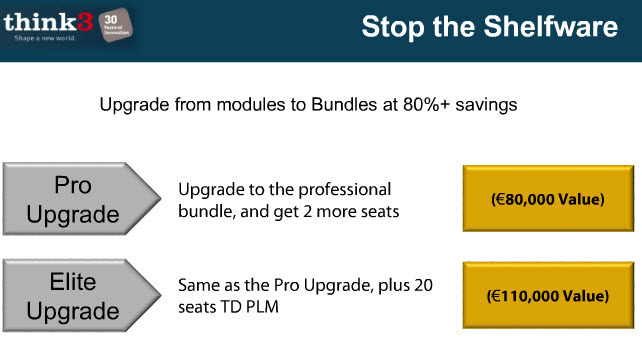 For the next 90 days, Scott announced what he called a “Stop The Shelfware” program in which existing customers will be able to shop around for software at the Think3 store and get a whopping 80% discount. Scott announced that they were suspending new feature releases in 2011. He said this was because of the time they needed to assess the quality of the existing code base and fixing things that needed to be fixed. Another question was “When will the 2010 release be available to the customer? A gap we have with think3 is that a release working on a 64bit platform is missing.” Scott admitted that a 64 bit version was the single most requested feature when he spoke to customers. He did not have a release date for the 2010 version. Once again he blamed the delay on the current process of evaluating the quality of the code. The next question was “What experience does Versata have with design software and what resources do they have in place to further develop the software?“. Scott replied that they have a variety of competencies across the entire Versata family. 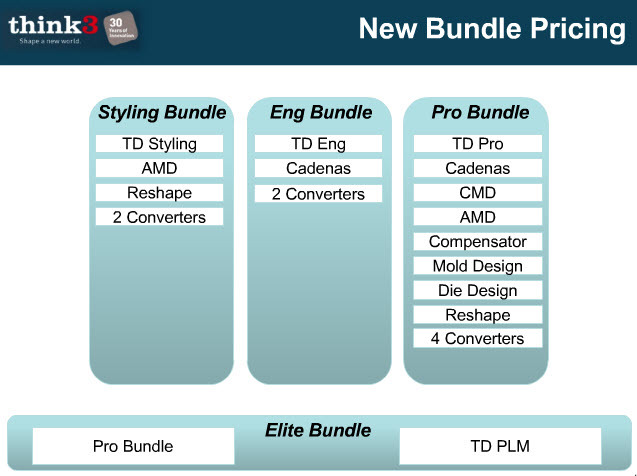 But he admitted, “Think3 is our first CAD software company. In terms of resources to further develop the software we have a network of thousands of programmers spread across the world. In the States, India, China, Ukraine and other countries“. The last question was “Marketing and technical support in the US has been minimal. Please tell us your plans to enhance think3’s name recognition and high level tech support“. Scott replied that he didn’t know why the US was not a priority for Think3. He said that Versata does shave a strong presence in the US market and he was trying to figure how how that could be leveraged by Think3. Scott ended by saying “I know an acquisition is a time for uncertainty and anxiety. I know you depend on our software for your business. The thing I want you to know is that we are going to be focused on you. We are not going to spend our resources on other things. I believe this will be a two year revitalization for Think3. I look forward to talking to you individually“.